Are you upgrading your existing setup and looking for a cost-effective solution? Are you designing a new motion control application? 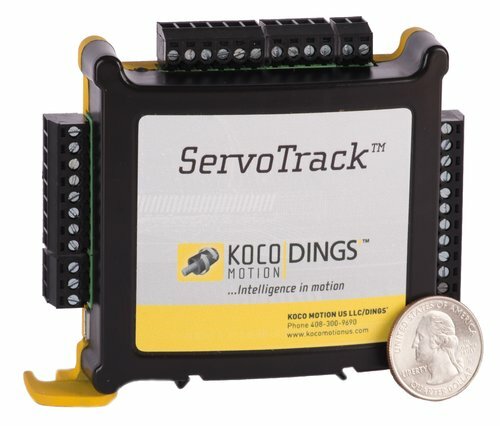 DINGS’ Motion USA is proud to present ServoTrack Motion System. This innovative piece of equipment is a dynamic closed loop motion control technology that will ensure you never lose functional control of your motors again. ServoTrack works by eliminating unintentional stalling that is common in step motors due to transient or sustained overload, extreme acceleration or deceleration or excessive slew speeds. This motion system includes the SnapTrack programming software, making it easy to design efficient motion profiles. Allow full use of your motor’s torque with minimal de-rating of the speed/torque curve. Never lose functional control of your motor. Lower the cost of your servo axis. Minimize the impact of system resonance. Allow for higher inertia mismatch when sizing your system. Add torque control for clamping, winding/unwinding, and tension control. Minimize motor heating, improving overall efficiency. Prevent transient load stalling on smart conveyor systems. Operate in velocity mode without the need of a controller. Provide for simple set-up with no tuning required. and eliminating the need for a high-resolution encoder. Our patented technology simplifies a complex process while simultaneously opening up new possibilities for your design engineers. You can truly reach your full potential with the ServoTrack Motion Sensor. Browse our site for more details including features, key benefits, and other specifications. DINGS’ Motion USA was founded in 2011 by motion control professionals; each of whom have been in the industry over many decades. Our mission is to earn your confidence as one of your most trusted and resourceful motion control suppliers. We combine Engineering and Manufacturing resources based here in the USA as well in China. We have created this website to be clear and easy to use for your precision engineering solutions. Our Application Engineering Team are all graduate engineers and are easily reached by phone and e-mail to provide you with timely technical answers and suggestions for the best solutions to your precision linear and rotary motion challenges. Once a product selection is made we also understand that the OEM Engineer wants a prototype unit in hand as soon as possible. We make these prototypes a high priority in our manufacturing schedule. The dedicated Customer Support team makes sure that your orders are accurately processed and our delivery commitments are taken very seriously. Stay tuned for Blog updates on motion technology, new products, technical information, and other news on a regular basis.